More no. of valves & larger glass area = faster reheat time (no need of backup electric heater) & higher overall temperature (more hot water). 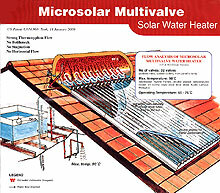 * sunny days (clear blue sky) in Kuala Lumpur, Malaysia, temperature measured at showerhead from 2 litres drawn off tank. No other water drawn off. estimates given above are based on customer feedback. 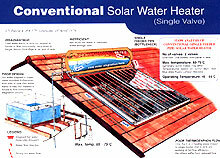 However, it is best to obtain written temperaturecommitments from those manufacturers concerned. All temperature readings taken during 1st year of operation for collectors. 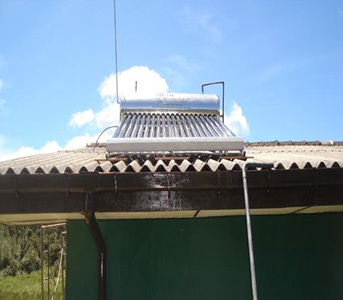 Microsolar Coaxial Multivalve (left) and Conventional Single Valve Solar Heater (right) on test at Nuwara Eliya, elevation 1800m Sri Lanka August 2008. Front view of Microsolar, capacity 264 litres, collector area 3.2sqm. 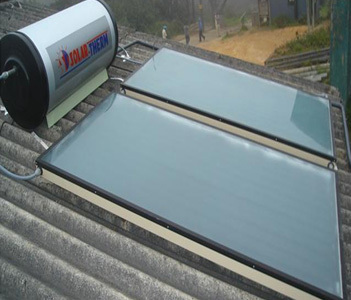 Side View of Conventional Single Valve Solar Heater, Capacity 150 litres, collector area 4.2sqm.